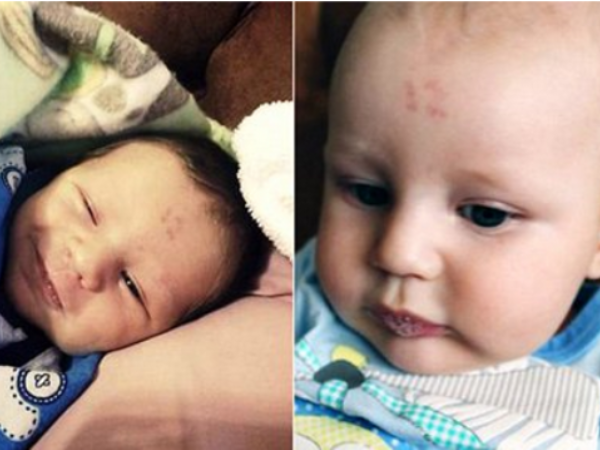 South African doctors were left puzzled after a baby was born with a perfect number 12 birthmark right in the middle of his forehead. Little Hanru van Niekerk, from Highlands in Johannesburg, has made news all over the world thanks to his special birthmark. Incredibly, his proud parents were so happy about his arrival on 11 November they initially failed to notice the unusual marking, reports Netwerk24. “My youngest daughter was the first one to see it and she said there is a 1 and a 2 on his forehead,” reveals Catherine Jooste, Hanru’s great grandmother. She describes Hanru as the friendliest baby she has ever seen. The family were not worried the birthmark because doctors assured them it will fade with time. A birthmark is an irregularity that appears on the skin that can appear before or shortly after birth. Depending on the type of birthmark, they are caused when blood vessels either don’t form properly or crowd around a specific area on the skin, leaving a distinct mark. Birthmarks do not hurt and usually fade or disappear completely with time.